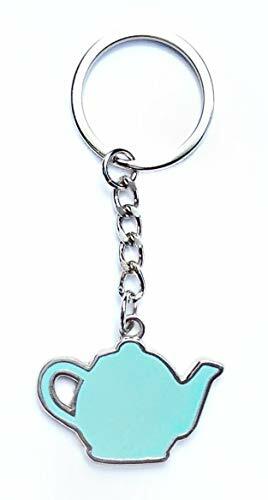 This is a teapot keychain inspired by Jim Halpert's thoughtful gift for Pam Beesly in The Office S2E10 Christmas episode. The keychain material is shiny nickel with a seafoam green enamel fill on both sides of the keychain. The teapot itself, measure 1" tall x 1.5" wide. The entire keychain measuring from the top of the ring to the bottom of the teapot measures 3.6 inches. This would be a creative gift, and is sure to bring a smile to any true fan of The Office. If you have any questions about this product by Chillkat, contact us by completing and submitting the form below. If you are looking for a specif part number, please include it with your message.